Have I got a gem for you today. Several weeks ago I whipped up a homemade toilet bowl cleaner when I was cleaning my bathrooms one weekend. I wanted to share it, but I didn’t write anything down of course and couldn’t remember what all I used. So the next time I cleaned my bathroom I made sure to measure and write down the ingredients so that I could share the recipe with you. I had never made homemade toilet bowl cleaner before because to be honest, I wasn’t sure how to apply it! Commercial cleaners have that nice angled neck on the bottle that allows you to squirt the cleaner right up under the rim. I wasn’t about to stick my hands up under there so I continued on using commercial cleaners until just recently. Here are all the ingredients and supplies you need besides a spoon and water which are not pictured. So simple! I usually make enough to clean the 2 toilets in the house and that’s it. The cleaner will stay good for awhile, but it’s so easy to make that I just make up a new batch each time I’m cleaning. 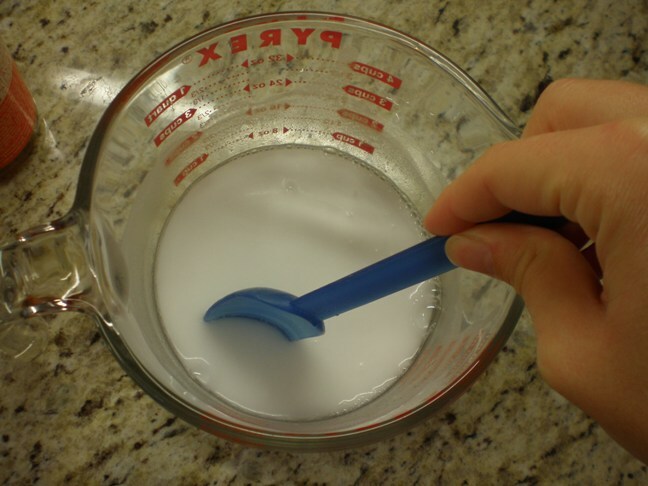 In the measuring cup, stir together the baking soda and water. It should be slightly thick. You want it to be thick so it will coat the toilet bowl. Then add 1/2 tsp of castille soap and stir. Once combined, pour mixture into the condiment bottle (this is why having a spout on the bowl is handy). With your finger over the tip, shake to combine again. Make sure all the baking soda that settled to the bottom gets incorporated into the mixture. Now you are ready to clean the toilet! The application can be a little tricky. You have to angle the bottle down so the mixture goes to the tip. But yet you want it up slightly so you can squirt it up under the rim. You’ll get the hang of it after a few tries. From here, the cleaning is exactly the same as with commercial cleaners. I squirt the homemade stuff all around the bowl, up under the rim. It runs down and coats the bowl, just like the expensive stuff. I let it sit for several minutes and then scrub it out with the bowl scrubber. I’m no scientist, so I can’t test my toilet for bacteria and all that. So I can’t tell you for certain how well the homemade cleaner works. But I will say that my toilet looks clean and smells clean! And really, isn’t that all the certainty you get from the commercial cleaners anyway? If you try this, let me know how it works! This looks great!! The commercial cleaners always scare me with how strong they are (and not to mention really toxic smelling). Alas, I have yet to find any place where I can buy a good quantity of baking soda. I’ll keep looking, because this looks like a winner!! I was at Target today, and in the cleaning section on the top shelf (near the Method cleaners), they had a HUGE box of baking soda. If you are a member of BJs (and probably any warehouse club), you can buy a 13.5 pound bag of Arm & Hammer baking soda that is resealable. An extra-large bag of baking soda can be purchased at Sam’s Club. You can buy soda at Sam’s club in bulk package. I bought a huge bag on Amazon! It’s so odd that you posted this today, because I actually googled “homemade toilet bowl cleaner” yesterday, got a link to your site, added it to my Google reader because I thought it looked interesting, and the first post that shows up in my reader is for homemade toilet bowl cleaner! Thanks for sharing!! Looks like a keeper! I love that there’s no harsh chemicals! 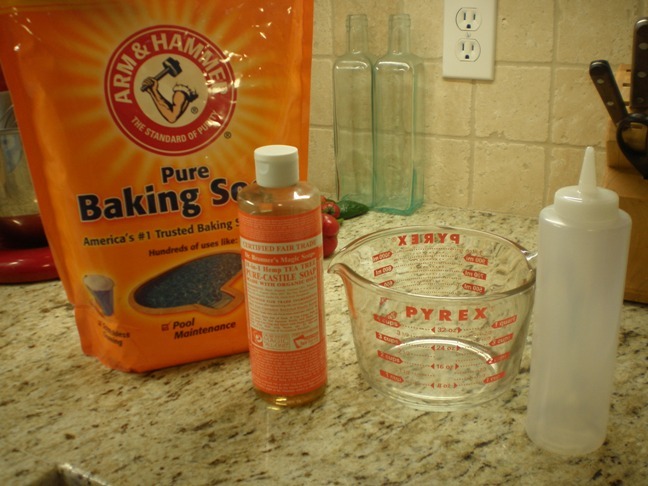 would a little Borax add a boost to the cleaning power or simply raise the toxicity of the recipe? Hi Patrick – Borax may indeed boost the cleaning power but it is slightly toxic. If you have small children or animals in the house you may want to refrain. Or add it to the cleaner in small doses. I have used Borax in homemade laundry detergent before with no issues so it’s really up to you to decide whether it would be helpful or harmful. Borax is no more toxic than ordinary salt. That isn’t to say that ordinary salt can’t kill a small child if they eat too much. It can. But if we are going to freak out over borax, then to be consistent we must put the salt under lock and key. BTW, borax tastes nasty whereas salt, well it isn’t too bad in small amounts. Yes, borax is toxic to cats. Though I don’t know any cats that get into the toilet and I always keep my cleaning supplies (toxic or not) on a higher shelf in the linen closet behind a latched door, out of the reach of animals and kids. I love simple cleaning and homemaking – your website rocks! Do you have to make this the day of cleaning or can you make it to sit around till next time you clean? Hi Stephanie. I’ve made this cleaner in advance before but only a few days. I don’t see why you couldn’t make it farther in advance except it might solidify. So then you might need a little water to loosen it up. Thanks for sharing this. Looking forward to using it ! This is a great recipe! I wonder if the tip of the condiment bottle could be trimmed at an angle, or pierced somehow so that the liquid comes out upwards. Hhhmmm….might have to expirement with that a little. Shelly, get a flexible straw from your local fast food place. Cut just below the flex and tape it to the spout of the bottle. Brilliant!!!! I can’t wait to try this! where do I find Castille soap? I have never heard of that. I’ve seen it at Target and Whole Foods. It comes in a bottle or a bar. Dr Bronners is the popular brand. If you Google Dr Bronners castille soap you can see what the packaging looks like! The Vitamin Shop sells it too. Carrie, The product that I use is Dr Bonner’s Liquid Castile soap, or bars of soap. I get mine at the local health food store, but see it at Amazon.com as well. I have heard that other stores may carry it, but I have not looked anywhere else. I use the Almond and Tea Tree ones, which I love both. THe many many uses for it are listed on the label, all around the bottle. I have used it right out of the bottle to shave my legs, and I clean greasy counter tops and the stove top with it. Good Luck…I hope you find some and like it as much as I do. You can buy castile liquid soap in Meijer’s if you’re near one of those. I will try this. I have very hard water and rusty water and can never find anything that will clean the toilet well that isn’t toxic. I just ran out of commercial toilet bowl cleaner and decided it was time to see if there was a homemade recipe. Thank goodness for Google and for people like you who are willing to go for it and give it a try. I will be trying this out today! I searched online for sources of Dr. Bronner’s castile soap and Walgreen’s stocks it. WIll pick some up tomorrow. I make homemade laundry detergent and fabric softener and can’t wait to try this! Thanks for sharing! Oh good, Walgreens has it? We don’t have a Target or Whole Foods near us and not sure what the Vitamin Shop is, so I was wondering where I was going to find some! I would try using vinegar instead of water in the recipe. I think it would help kill bacteria. Thanks Glenna! I’ve been meaning to post the same thing. also, the reason for the foaming is it’s a chemical reaction and so might not work the same. The result after the reaction is salt water. Might be ok to add the vinegar separately as a “rinse”? Speaking of the baking soda/vinegar reaction… That’s how I freshen and clean my drains in tubs and sinks… Also the disposal. Dump some baking soda down and let it sit a minute or two then pour vinegar down on it. When I do this regularly I rarely get clogged drains. I ran out of toilet bowl cleaner last week and made a version of this as an alternative to running out to the store to buy some. It worked really well! I like it so much, I’m sharing it on my blog. Thanks for posting your recipe! If you run out of toilet bowl cleaner, use the container to make the homemade stuff and you have the angled spout as well ! Sounds great! I have been doing the “flylady” thing since 2004 and haven’t bought toilet cleaner since! I just use up whatever soap I have. 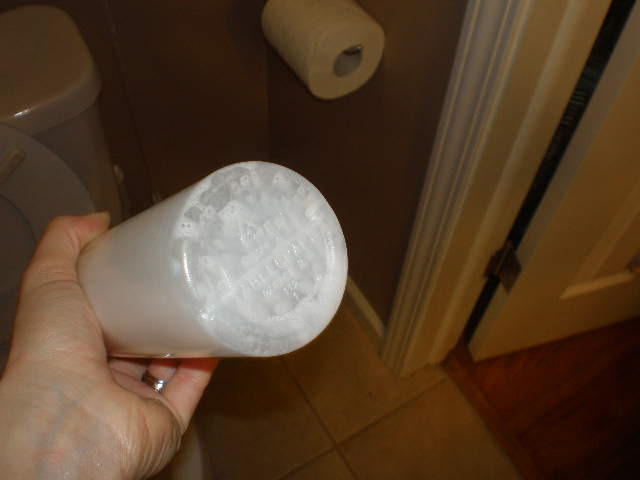 I have some old store bought laundry soap that I am using up right now to clean the toilets….. 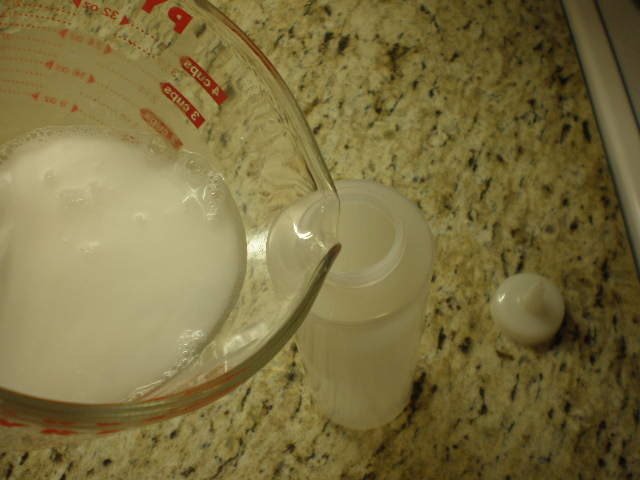 I have used dish soap and shampoo with great success too…… Using up what I have that I don’t want to use on our skin….. 🙂 My homemade dishwasher soap works absolutely fantastic! The recipe is on my blog. Couldn’t an old toilet bowl bottle be washed out and reused? I would think so. I haven’t tried it but I don’t see why it wouldn’t work. Ecover toilet bowl cleaner is a reusable container. I tried this and don’t like this pine fresh scent. I’m going to try your recipe but with peppermint Castile soap that I got in bulk from our local whole foods coop. Biokleen makes a soy toilet scrub that has a much milder scent. I’m still not satisfied with that either, so I’m happy to have a recipe that I can refil both bottles with. Btw, I love Flylady too!!! Yes, definitely! I just I tried it with a newly emptied toilet bowl cleaner. I was able to take off the cap and inner “spout”. The cap works like a child-proof medicine bottle and if you squeeze and turn it, you can take it off. I also took out the “inner spout”. After rinsing, I refilled with this solution, replace the spout and cap and I’m good to go. If the solution clogs the inner spout, you can make the hole larger with the point of a scissors. Just be careful when you shake the bottle. Since it is not toxic you can cover the hole with your finger. Thank you Laura— I was scanning the comments to see if anyone asked why add the tea tree oil!! Now I get it 🙂 I actually have some for my scalp treatments, so I’m definitely going to give this a try!!! Lavender oil has antibacterial properties too and it smells wonderful! Some beauty supply stores have permanent solution bottles with angled tips. Another easy way to clean the bowl part is to buy some denture whitening tablets ( I found 40 for a $1.50). Drop them in the tolet and let them sit over night. I usually use two. I live in an area that the water leaves spots all the time. I have also used this to clean my white tub. I will fill it about 2 inches full…then drop about 4 or 5 tablets in and let it sit over night. I was amazed at how clean it made the tub. Where do you find denture whitening tablets so cheap? Very excited to try this. I have a part time cleaning business cleaning vacation rentals during the summer in NJ. I’m always looking for cleaners that are economicl and eco friendly. Can’t wait to try this one! Aloha! I used the bottle used to mix my hair dye. It was just the right size for one toilet. I knew I could use that squirt bottle for something. I know I’m coming in late, but I thought I’d offer a few pointers. The homemade laundry detergent will explode if you add baking soda or oxyclean to give it a boost. Don’t know if it’s the borax and soda or the washing powder, but it’d be something to consider. As far as baking soda and vinegar, I had a bookshop a few years ago. Old building, partially collapsed pipes, toilet paper caught in pipes, plumber has to be called. I found a recipe for vinegar and baking soda (also works well with septic systems) where you drain most of the water out of the toilet bowl. Pour in a cup of soda, followed by a cup of vinegar and let it set over night. Unclogged my pipes every time. I like the cling feature as well! Would love to try this but I have a septic tank and plumber warned me against putting powders in drains or toilet on a regular basis, (This after I told him how great baking and baking soda worked in slow tub drain.) He also cautions against using bleach as it kills bacteria needed for proper septic processing.. Perhaps he just wanted more business from me. Can anyone reassure me that this recipe is safe to use for a long period of time. Baking soda can be purchased at most livestock feed stores in 50 pound bags. I just stuck the end few inches of a bendy straw on the end of a condiment bottle and secured it with a small piece of duct tape. That way I could angle it with ease. Loved this cleaner recipe! What is castille soap? What would be a good alternative if I can’t source that here? Castille soap is a very mild soap that comes in a liquid or bar form. Dr. Bronner’s is the most popular brand. 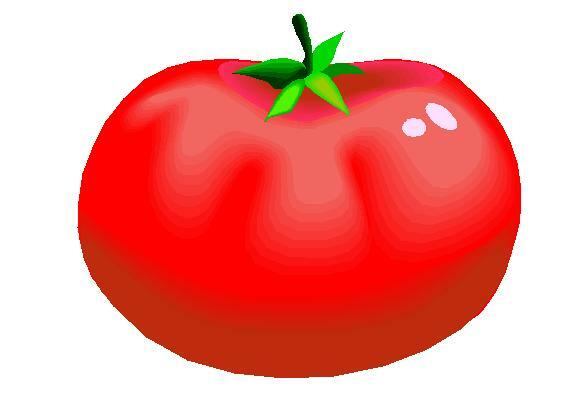 It is sold at most health food stores and also at Vitamin World. I think I’ve seen it at Target but I am not completely certain. I think liquid dish soap could be used as an alternative in this cleaner though I haven’t tried it myself. Let me know if you do and if it works! add a little peroxide and the germs are taken care of! I like your homemade cleaner idea. Now for a real test though, we live in California and conserve water by doing the, if it is yellow let mellow, if it is brown flush it down. In other words we don’t flush every time. So the toilet neck drain at the bottom of the bowl has a build up of crud. Will the cleaner remove the crud or what else can I do for that? I want to thank you SO much for this because, ever since we moved into our new apartment, this horrendous urine smell has been exuding from our toilet, and the managers don’t seem to care. I think there are tons of mold on the inside from years of people living here and not cleaning the toilet. It really upsets me, and I have tried everything. When I tried your magical potion, however, the smell REALLY diminished!! THANKS SO MUCH! You should find out when was the last time they replaced the toilet bowl seal! Most places replace them when tenants change! I have used a pumice stone found at the hardware stores (Home Depot has them where I live) to remove the hard water ring. You are pure genius! Thank you so much. I’ve been looking for something like this but hadn’t had any luck. Until now. I can’t wait to make this up. Will let you know how it works out. Where do you purchase your castile soap? Hi Melinda – you can buy castile soap at Target. It’s in the natural beauty products section, by cosmetics and skin care, usually on the bottom shelf. You can also buy it at Whole Foods, Natural Grocers or any other “health” type store. Amazon sells it too! the hairs are so gross on the rim! Seriously gross! Is this something that I can save the leftovers for anther week and use again, or should it all be used in one application and made fresh each time? Hi Brooklyn – sorry it’s taken me so long to respond. I have saved the leftovers for a couple weeks with no issues. 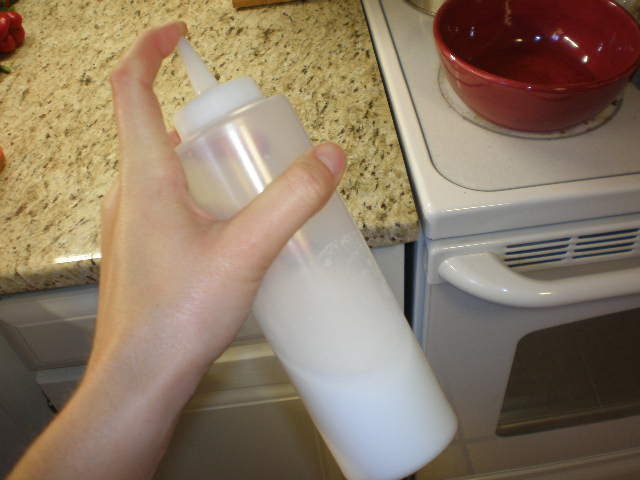 The baking soda will settle on the bottom so you will just have to put your finger over the spout and shake it pretty good to get it all mixed back together. Hey I tried this and it’s amazing. I cut the top part of a bendy straw and stuck it to the tip of the bottle making an angled applicator. Works like a charm. Thanks again. Great idea using a bendy straw! If you go to the beauty supply shop you can get a hair applicator bottle that has an angled spout. This would work great in place of a normal squirt bottle.